Embedded systems in various form-factors for harsh environment conditions. 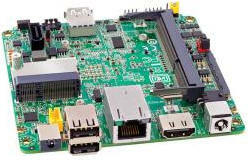 The new Intel D945GCLF mini-itx main board, from Intel, powered by the incredible Atom CPU, is now available. This very low power CPU (TDP = 4W), with multiple thread support, is exceptionally efficient. Capable of powering Vista Home Media Center, for example, with ease. 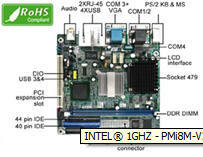 The Atom 230 CPU used on this board is a 1.6GHz model, with 512K of L2 cache, based on Intel’s latest 45nM process. The supporting chipset, the Intel 945GC + ICH7 provides desktop connectivity and performance. 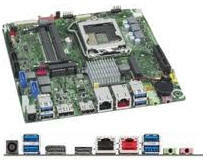 Intel high definition audio, 10/100 LAN, PCI, SATA2 (3GB/s) DDR2 533/667 are all there, to ensure connectivity, expandability and performance. Build you new mini-itx project, or upgrade your mini-itx project today, and get a huge performance boost (typically 3-4x benchmark improvement, when compared to a VIA C7 1.5GHz / CN700 system, per benchmark software ie Sandra etc). This enhanced board has a prefitted power cable so that it can be used without the P4 connector being plugged in, i.e. if your power supply does not have a P4 connector, you can use this board.